Climate change vulnerability assessment is a rapidly developing field. However, despite the fact that such major trends as globalization and the changing characteristics of the political and economic governance systems are crucial in shaping a community�s capacity to adapt to climate change, these trends are seldom included in assessments. 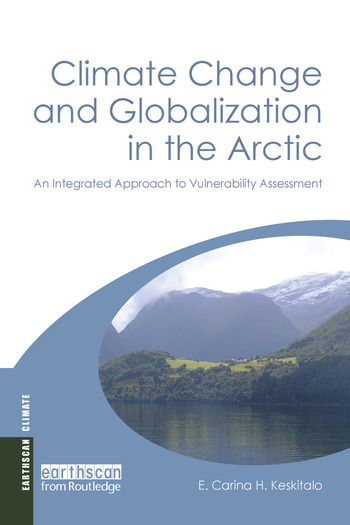 This book addresses this shortcoming by developing a framework for qualitative vulnerability assessment in �multiple impact� studies (of climate change and globalization) and applying this framework to several cases of renewable natural resource use. The book draws upon case studies of forestry and fishing - two of the largest sectors that rely on renewable natural resources - and reindeer herding in the European North. The study represents a bottom-up view, originating with the stakeholders themselves, of the degree to which stakeholders find adaptation to climate change possible and how they evaluate it in relation to their other concerns, notably economic and political ones. Moreover, the approach and research results include features that could be broadly generalized to other geographic areas or sectors characterized by renewable natural resource use. E. Carina H. Keskitalo is Associate Professor of Political Science at Ume? University, Sweden, and a researcher in national and international projects on adaptation to climate change.